UPDATE: This article is about hypocrisy and duplicity-- and how Libertarian propaganda is being used to obscure a distinctly reactionary agenda-- not Freemasonry per se. Please read the whole thing --and some of the insightful comments as well-- before making your mind up one way or another. And please be aware that The Secret Sun is both a kneejerk-free zone and a dues-paying member of the Reality-Based High Weirdness Community. Well, the Clownshow's back in town and from the looks of things it going to be clownier than ever before. We have a Wall Street underling in the White House who is attacked regularly by his opposition party as a "socialist," even though intelligent (read: non-racist) conservatives acknowledge he's governing as a classic Rockefeller Republican (with all that implies for parapolitics watchers, I might add). On the other side of the aisle the GOP leadership has put its hopes in a candidate who may well have been manufactured in Skynet's Terminator factory and is instinctively loathed by 75% of his own party. So much so that he got the scare of his life from an overgrown altar boy (with all that implies for parapolitics watchers, I might add). 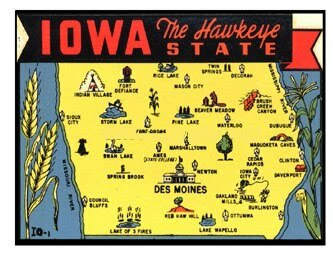 Gee, why does Iowa vote first? 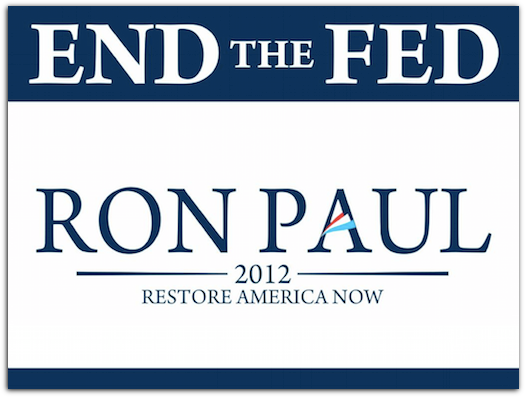 Then there's the Great White Hope of the Libertarian/Neo-Confederate alliance, Ron Paul. No one is quite acknowledging it (except his son, judging from his facial expression last night), but Paul needed to win last night more than anyone else and was in fact polling as such. Paul's mystique is built on being the supposed champion of the Silent Majority and coming in a weak third to the two of the lamest candidates in living memory-- and in a caucus where Independents and Democrats could register as Republicans and vote-- doesn't exactly bolster that image. But caucuses aren't primaries and apparently they tend to winnow out the enthusiastic but impatient. A lot of his support on the ground were his version of Deadheads- true believers from out of state hitching a ride on the campaign trail. 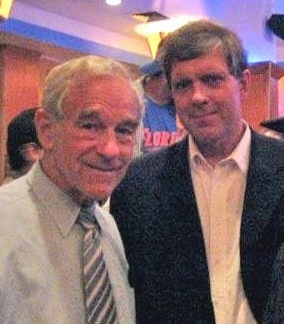 Most of the younger voters are attracted to Paul's antiwar and anti-Prohibition policies while tending to ignore his more problematic domestic agenda. "They've got it all backwards." Even so, I'm not going to try to argue with Paul's Deadheads anymore. Why? Because I now understand the very sophisticated coded messages he's sending out there (more than they do, perhaps) and I think I better understand the powerful emotional response they instill now. I was actually hoping he'd win so he could do maximum damage to the duopoly and expose the Clownshow for what it really is. Maybe he still will, but I feel a corner has turned. The soda's lost its fizz. For all his talk of reason, Paul is hitting a bruised and disoriented Middle America -- particularly the white working class-- with a powerful, symbolically-charged emotional stew promising a return to antebellum Southern folkways and an America better described in the Articles of Confederation than the Constitution. I certainly understand why this is so seductive in these days of Globalism and multiculturalism, even if I don't agree with it. But the fact remains that he's sending a different coded message to his fellow initiates. "We're the same underneath it all"
I didn't vote in 2008 and I don't plan to vote in this election either so I have no clown in this show. 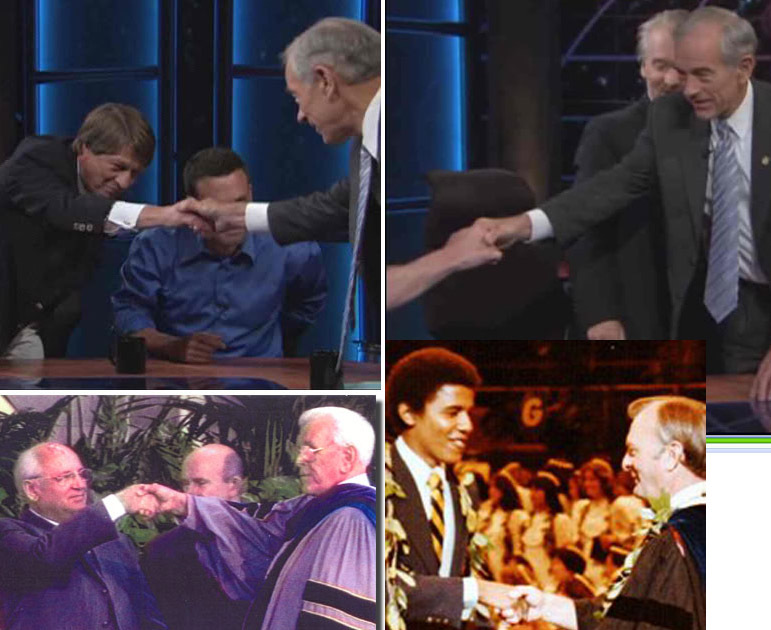 And besides, what's much more fascinating to me is Ron Paul's almost compulsive display of high initiate secret society symbolism. Which is to say that although other bloggers have claimed that Paul is a Mason --including some Masons themselves-- he has denied it (kind of). But that hasn't exactly stopped speculation on the issue. Now, the controversy that's dogged Paul has been his newsletters, and to a lesser extent his deep and longstanding ties to extreme right sects like the Christian Reconstructionists and the Neo-Confederate underground. In the first place, Republican criticism of the Ron Paul Newsletters is pretty rich given the language in them is identical to what's heard on the AM talk radio circuit that GOP lawmakers and power brokers work every hour of every day. Even so, with the fanatical support Paul has in the White Nationalist community the question has been raised if Paul himself is racist. I think this is the wrong question. What people are really asking if Paul himself is a bigot or a hater. I don't think he is. I think Paul sees himself in a long tradition of paternalist Southern conservatives who understand the way the world really works, son, and think everything will return to its idyllic, antebellum state once that pesky, outside-agitatin' Federal Government with its sissy talk about "civil rights" is done away with for good. In this, Paul falls smack dab into the old/new (Masonic) hierarchy of the South, which believes passionately in natural orders, natural laws and especially, natural hierarchies. Unfortunately, working class whites don't figure much higher than blacks in this natural order. But of course the Masons-- Scottish Rite Masons, to be precise-- were at the top of the plantation Pyramid. 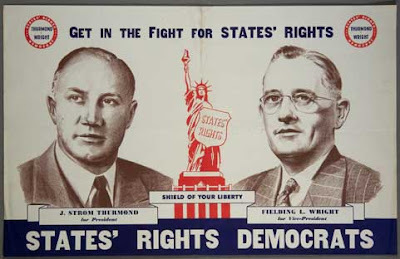 What Northern liberals never understood is that the Masonic Dixiecrats (who enriched themselves with New Deal millions and then turned around and shattered the New Deal coalition) were not drooling, foaming, bloviating racists as you might see in a Hollywood movie. What they really hated were do-gooders and busybody outsiders who don't understand "the natural order of things." 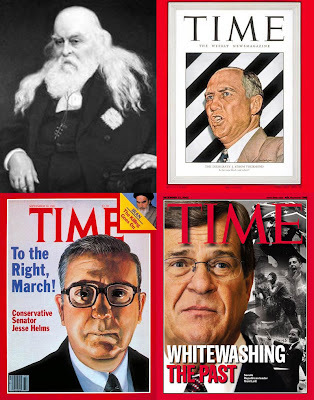 Scottish Rite Freemasons like Albert Pike, Strom Thurmond (who kept a black lover who bore his child), Jesse Helms and Trent Lott invented the language of "state's rights" and "limited government" that Paul peddles everywhere he goes. Northerners might be totally baffled by this language but it strikes a deep and powerful chord for a lot of conservative Southerners (and now Tea Party rightists everywhere). It means dismantling the welfare state, abolishing anti-discrimination laws and civil rights laws, dismantling separation of church and state (all of which are included in Paul's platform, of course) and all of the other innovations that shattered the idyllic bliss of the Plantation system and its direct descendants. Paul might not tell his young, idealistic followers that's the endgame for his anti-Federal agenda, but the circles he's traveled in for his entire adult life will explain it to you at length, if you like. As would the Dixiecrats who wrote Paul's gameplan long before he showed up will as well. 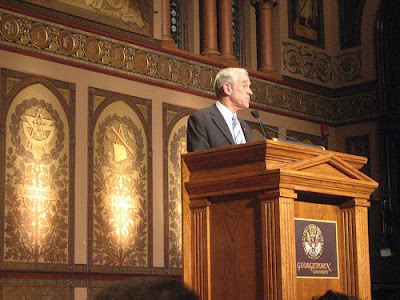 In a January 4, 2008 article on the Official Confederate States of America (CSA) Government website, it was claimed that Ron Paul was "the only candidate who might be friendly to the restoration of the Confederacy" ...The article also stated that the CSA has "known for years Ron Paul to be essentially a Confederate in his stand on the issues"
But if you read his platform carefully you'll see that Paul differs from his CSA friends in that he would dismantle the entire Federal government and impose a de facto Confederate system on the North as well. But this is not about "race hate" for Paul. That's for the help. This is about dismantling the Federal system-- finishing the work begun in the Civil War-- and returning to the Feudal system that ruled the South since colonial times. The way things should be. That Paul is a transplanted Northerner shows just how powerful this vision of the world can be outside of Dixie (no one is more committed to a cause than a converted enemy). And that this all squares nicely with Ayn Rand's Liber AL teleology shows it's not limited to America either. But is Paul a Freemason? One fact people have pointed out is that Ron Paul's wife is Eastern Star and his daughters are Rainbow, an arrangement essentially unheard of for a man who is not in fact a Mason himself. 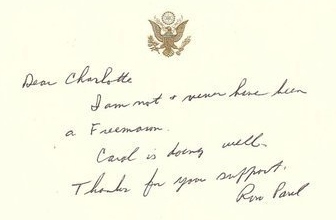 In this handwritten letter (note the reverse of the Great Seal) to a "Charlotte" published on his site Paul denies being a "Freemason." And here's where we come to the classic non-denial denial. A "Free" Mason is a member of the Ancient, Free and Accepted Masonic Order. There are other Orders that do not define themselves as "Free." Several, actually. Do you see the hidden Eye in the Triangle? 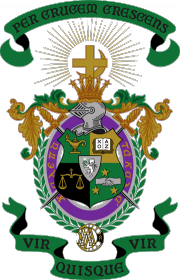 Paul is a proud member in good standing of Lambda Chi Alpha, yet another Masonically-created fraternity that is classified as a "secret" fraternity. Lambda Chi traces its origins to Boston (birthplace of American Freemasonry) and Phila(e)delphia, in Paul's native Pennsylvania. Here's an obituary of Lambda Chi's founding father, John E. "Jack" Mason (seriously). Funeral services were held on Wednesday, June 5, at the Oliver H. Bair funeral parlors in Philadelphia. Cremation and private burial were in Woodland Cemetery. Masonic services were conducted by Lodge 51, of which he was a past master, the preceding evening with his close friend and associate, past Grand High Alpha Fischer, in his station of senior warden. That Lambda Chi is in fact a Masonic fraternity and not just a drinking club is made clear by its original seal, prominently featuring a Masonic handshake. 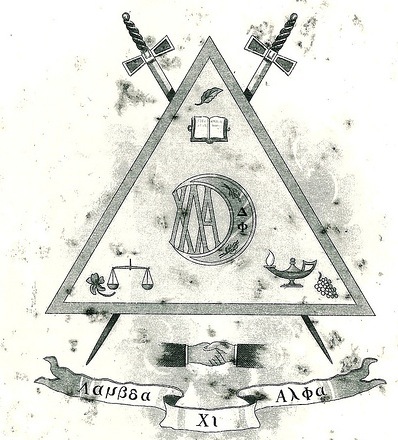 Lambda Chi also includes an inner body called "The Mason's Circle," a classic example of esoteric double-entendre. It's current seal also features the handshake, which is overshadowed now by explicit Knights Templar (and Solar) iconography, as well as the cojoining of the cross and the crescent, which is a byword for the Order. • Is Ron Paul a Free-mason? Probably not. • Is he a member of at least one Masonic fraternity? Without question. Paul's Presidential announcement should tickle the fancy of Masonic ritual watchers, for both obvious and more obscure reasons. • First of all was the day and date: Friday the 13th. This should be obvious for most readers but for those who are not, it was the day and date of the suppression of the Templars and includes the number 13, which is sacred to Masons. Read about both here. Or just look at a dollar bill. Arrow points to the "Star of the East." 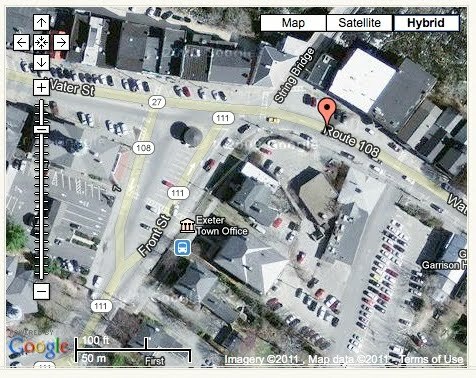 • Second was the physical location-- in the Exeter (NH) Town Hall, which is a literal stone's throw from the "Star of the East" Masonic lodge. More on Exeter in just a bit, since it's crucial to Masonic history. Diagram from NASA, speaking of Scottish Rites. 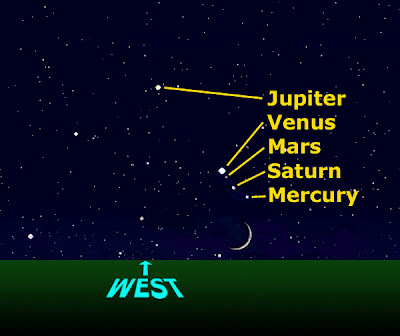 In a rare planetary event, Mercury, Venus, Mars and Jupiter, will appear together (within around 2 degrees of each other) in the eastern sky just before dawn this Friday. The event will be particularly spectacular for Sydneysiders. From 5am, the four planets will be clearly seen just above the horizon in the east. 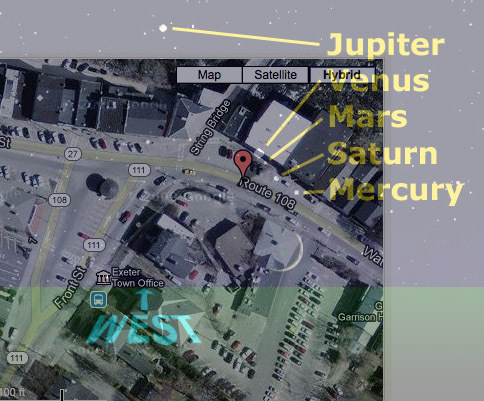 The brightest planet will be Venus sitting in the middle of the group. Just above and to the left of Venus and almost as bright is Jupiter. To the right of Jupiter and slightly fainter will be Mercury. Sitting below these three planets and fainter again will be Mars. Venus is the "star of the east." Whatever your opinion of Richard Hoagland, he repeatedly proved that celestial alignments were crucial to the Scottish Rite Masons in NASA, so it's doubly difficult to imagine that Paul chose this day at random. Who the hell shakes hands like that? So not only do we have acknowledged secret society initiate Ron Paul announcing on what is essentially a Masonic holy day, it's during an ultra-rare planetary alignment and takes place literally across the street from a Masonic Lodge. If that isn't meaningful to you, you're reading the wrong blog. The scope of this ritual is breathtakingly audacious. Obama-worthy, even. But if the Masonic tradition is as important to you as it was to your direct ideological forebears, announcing your candidacy in a town named "Exeter" would have an added ritual super-charge. England and on the continent. in the fabric rolls of Exeter Cathedral in the year 1396." 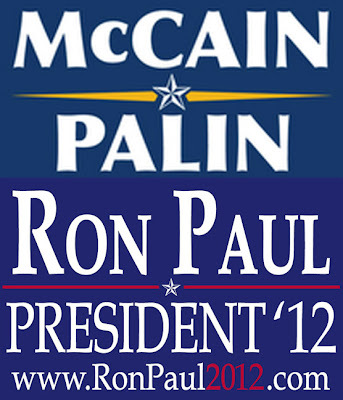 Now will any of this sway Ron Paul's acolytes from his cult? No, of course not. It's not intended to. There's no way I can compete with this guy's multimillion dollar propaganda machine or the thousands of his alt-media sycophants. Besides, no one understands the appeal of turning back the clock more than me (though for me it's the mid-90s). And Paul's radicalism might wake people up and inspire liberals and conservatives in northern states to realize they have a lot more in common with each other than they do with Paul's Confederate revanchists and start taking large-scale secession (and the Second Amendment) more seriously. And you know me- I love this stuff. The Obama crew has been awfully quiet symbol-wise and I was just getting ready to tune the whole Clownshow out. And I still want Paul to be the turd in the party's punchbowl-- and wake Northern conservatives up to exactly who the hell they've been in bed with for the past 30 years. That's the great thing about extremists- they tend to clarify issues that the more moderate can obscure. Sidebar: For Secret Sun purposes Exeter, NH is important in that one of the most puzzling UFO flaps in the 1960s occurred there, inspiring the bestselling book Incident at Exeter. Phillips Academy Exeter is also there, the sister school to the more well-known Phillips Academy Andover over the border, the school of choice for the plutocratic elite. For the geeks: Exeter founder John Phillips coined the phrase, "With great power comes great responsibility." I deleted the KFC bumper sticker since no one seemed to understand that it was a joke and not part of the story. 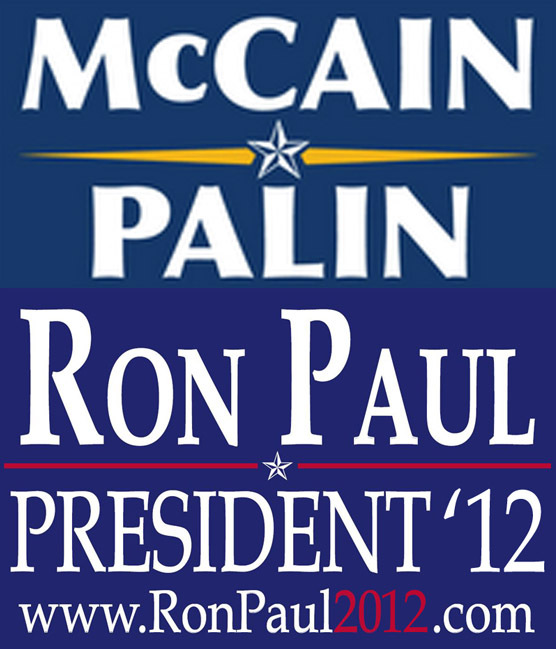 All of the other campaign logos are official.